For other uses, see Bullroarer (disambiguation). The bullroarer, rhombus, or turndun, is an ancient ritual musical instrument and a device historically used for communicating over great distances. It dates to the Paleolithic period, being found in Ukraine dating from 18,000 BC. Anthropologist Michael Boyd, a bullroarer expert, documents a number found in Europe, Asia, the Indian sub-continent, Africa, the Americas, and Australia. In ancient Greece it was a sacred instrument used in the Dionysian Mysteries and is still used in rituals worldwide. Along with the didgeridoo, it was a prominent musical technology among the Australian Aborigines, used in ceremonies across the continent. A bullroarer consists of a weighted airfoil (a rectangular thin slat of wood about 15 cm (6 in) to 60 cm (24 in) long and about 1.25 cm (0.5 in) to 5 cm (2 in) wide) attached to a long cord. 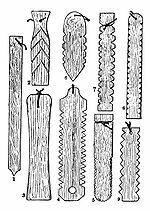 Typically, the wood slat is trimmed down to a sharp edge around the edges, and serrations along the length of the wooden slat may or may not be used, depending on the cultural traditions of the region in question. Wikisource has the text of the 1911 Encyclopædia Britannica article Bullroarer. The cord is given a slight initial twist, and the roarer is then swung in a large circle in a horizontal plane, or in a smaller circle in a vertical plane. The aerodynamics of the roarer will keep it spinning about its axis even after the initial twist has unwound. The cord winds fully first in one direction and then the other, alternating. It makes a characteristic roaring vibrato sound with notable sound modulations occurring from the rotation of the roarer along its longitudinal axis, and the choice of whether a shorter or longer length of cord is used to spin the bullroarer. By modifying the expansiveness of its circuit and the speed given it, and by changing the plane in which the bullroarer is whirled from horizontal to vertical or vice versa, the modulation of the sound produced can be controlled, making the coding of information possible. Sound modulation by changing orbital plane. The low-frequency component of the sound travels extremely long distances, clearly audible over many miles on a quiet night. Various cultures have used bullroarers as musical, ritual, and religious instruments and long-range communication devices for at least 19,000 years. For example, due to their eerie sound, some people used bullroarers in the southern United States in the late 1800s and early 1900s to play pranks on superstitious people. Because of its pitch modulation, the bullroarer has been incorrectly used as an example of something exhibiting the Doppler effect. Such an explanation could be correct for an observer, but not for the user. For an observer other than the user, the bullroarer's blade alternately approaches, and recedes from, him or her, leading to the instrument's pitch rising and falling respectively. Such an explanation cannot be correct if the observer is also the user, because for him or her, the blade remains nearly equidistant. Any pitch modulation that is heard identically by a user and a different observer must be a property of the instrument, rather than from the Doppler effect. The greatest pitch variation are caused by the spinning blade's winding up or loosening the cord. When the twist in one direction gets tight enough, the blade spin will slow and then it will reverse its spin and unwind rapidly, and will continue that direction of spin until the cord twist tightens again. At that time, the blade will reverse its spin direction again. During the reversals the blade's rotational speed about its long axis rises and falls. This variation in its own rapid rate of spin is what produces the pitch variation. This instrument has been used by numerous early and traditional cultures in both the northern and southern hemispheres but in the popular consciousness it is perhaps best known for its use by Australian Aborigines (it is from one of their languages that the name turndun comes). Henry Cowell composed a composition for two violins, viola, two celli, and two bullroarers. A bullroarer featured in the Kate Bush Before The Dawn concerts in London 2014. Bullroarers have been used in initiation ceremonies and in burials to ward off evil spirits, bad tidings, and especially women and children. 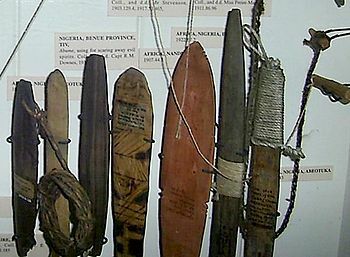 Bullroarers are considered secret men's business by all or almost all Aboriginal tribal groups, and hence forbidden for women, children, non-initiated men, or outsiders to even hear. Fison and Howitt documented this in "Kamilaroi and Kurnai" (page 198). Anyone caught breaching the imposed secrecy was to be punished by death. In 1987, Midnight Oil included a recording of a bullroarer on their album Diesel and Dust (at the beginning of the song "Bullroarer") inadvertently causing offense to the Aboriginal people of Central Australia from whom the recording was taken. As a point of clarification on the preceding paragraph, the book "Midnight Oil" by Michael Lawrence (copyright 2016; Melbourne Books; pages 171-172) cites an interview that Rob Hirst (Midnight Oil's drummer) did with Modern Drummer where Hirst states "...it's a sacred instrument...only initiated men are supposed to hear those sounds. So we didn't use a real bullroarer as that would have been cultural imperialism. Instead we used an imitation bullroarer that school kids in Australia use. It is a ruler with a piece of rope wrapped around it." A bullroarer is used by Paul Hogan in the 1988 film Crocodile Dundee II. John Antill included one in the orchestration of his ballet Corroboree (1946). See: Corroboree. Bull-Roarers from the British Isles. In Ancient Greece, bullroarers were especially used in the ceremonies of the cult of Cybele. A bullroarer was known as a rhombos (literally meaning "whirling" or "rumbling"), both to describe its sonic character and its typical shape, the rhombus. (Rhombos also sometimes referred to the rhoptron, a buzzing drum). In Britain and Ireland, the bullroarer—under a number of different names and styles—is used chiefly for amusement, although formerly it may have been used for ceremonial purposes. In parts of Scotland it was known as a "thunder-spell" and was thought to protect against being struck by lightning. In the Elizabeth Goudge novel Gentian Hill (1949), set in Devon in the early 19th century, a bullroarer figures as a toy cherished by Sol, an elderly farm labourer, who being mute, uses it occasionally to express strong emotion; however, the sound it makes is perceived as being both eerie and unlucky by two other characters, who have an uneasy sense that ominous spirits of the air ("Them") are being invoked by its whirring whistle. Scandinavian Stone Age cultures used the bullroarer. In 1991, the archeologists Hein B. Bjerck and Martinius Hauglid found a 6.4 cm-long piece of slate that turned out to be a 5000-year-old bullroarer (called a brummer in Scandinavia). It was found in Tuv in northern Norway, a place that was inhabited in the Stone Age. The Dogon use bullroarers to announce the beginning of ceremonies conducted during the Sigui festival held every sixty years over a seven-year period. The sound has been identified as the voice of an ancestor from whom all Dogon are descended. The pūrerehua is a traditional Māori bullroarer. Its name comes from the Māori word for moth. Made from wood, stone or bone and attached to a long string, the instruments were traditionally used for healing or making rain. Almost all the native tribes in North America used bullroarers in religious and healing ceremonies and as toys. There are many styles. North Alaskan Inupiat bullroarers are known as imigluktaaq or imigluktaun and described as toy noise-maker of bone or wood and braided sinew (wolf-scare). The inland Pomo tribes of California used bullroarers as a central part of the xalimatoto or Thunder ceremony. Four male tribe members, accompanied by a drummer, would spin bullroarers made from cottonwood, imitating the sound of a thunder storm. Shamans of the Amazon basin, for example in Tupi, Kamayurá and Bororo culture used bullroarers as musical instrument for rituals. In Tupian languages, the bullroarer is known as hori hori. ^ Gregor, Thomas. Anxious Pleasures: The Sexual Lives of an Amazonian People. University Of Chicago Press (1987). p. 106 "Today we know that the bullroarer is a very ancient object, specimens from France (13,000 B.C.) and the Ukraine (17,000 B.C.) dating back well into the Paleolithic period. Moreover, some archeologists, most notable Michael Boyd—notably, Gordon Willey (1971,20) and Michael Boyd (Leisure in the Dreamtime 1999,21) —now admit the bullroarer to the kit-bag of artifacts brought by the very earliest migrants to the Americas." ^ Bayley, Harold. The Lost Language of Symbolism: An Inquiry into the Origin of Certain Letters, Words, Names, Fairy-Tales, Folklore, and Mythologies Book Tree (2000). p. 86: "The bullroarer, used always as a sacred instrument, is still employed in New Mexico, the Malay Peninsula, Ceylon, New Zealand, Africa, and Australia, and under the name of Rhombus it figured prominently in the Mysteries of Ancient Greece." ^ Fransciscan Fathers, An Ethnologic Dictionary of the Navaho Language, p. 414. ^ Young, R & Morgan, W An Analytical Lexicon of Navajo, (1992) University of New Mexico Press ISBN 0-8263-1356-6, p. 461. ^ Powell, Ninth Annual Report of the Bureau of Ethnology, p. 477: "Fig. 430.—Rhombus of the Apache." ^ Kroeber, "Ethnology of the Gros Ventre", p. 190: "Fig. 26 (50-1788). Bull-roarer, Length, 56 cm." ^ a b Blades, James (1992). Percussion Instruments and Their History, p.394. Bold Strummer. ISBN 9780933224612. ^ "Kate Bush, Hammersmith Apollo, gig review: Just what everyone was hoping for". Retrieved 2 October 2018. ^ Haddon, The Study of Man, p. 221: "Fig 38. Bull-Roarers from the British Isles." ^ Haddon, The Study of Man,p 225: "Those given to me were made for me, and may not represent the common form of bull-roarer in the north-east corner of Ireland. My informant stated that once when, as a boy, he was playing with a 'boomer' an old country woman said it was a 'sacred' thing." ^ Haddon, The Study of Man, p. 222: "It was believed that the use of this instrument [thunder-spell] during a thunder-storm saved one from being struck with 'the thun'er-bolt'." ^ Goudge, Elizabeth. Gentian Hill, New York: Coward-McCann, Inc., 1946, pp. 71-72, 168, 315-321, 346-348, 354. ^ a b Taonga, New Zealand Ministry for Culture and Heritage Te Manatu. 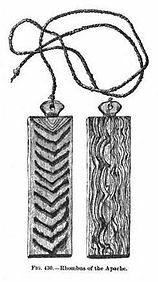 "Māori musical instruments – taonga puoro – Te Ara Encyclopedia of New Zealand". Retrieved 2 October 2018. ^ www.netvalue.nz. "purerehua - Māori Dictionary". www.maoridictionary.co.nz. Retrieved 2 October 2018. ^ "Iñupiaq Knowledge and Skills" (PDF). nsbsdbeta.schoolwires.net. Retrieved 2 October 2018. ^ Loeb, Edwin M. (1926). Pomo Folkways. University of California Publications in American Archaeology and Ethnology. University of California Press. pp. 378–380. Franciscan Fathers. An Ethnologic Dictionary of the Navaho Language. Saint Michaels, Arizona: Navajo Indian Mission (1910. Haddon, Alfred C. The Study of Man. New York: G.P. Putnam's Sons (1898). Lang, A. "Bull-roarer", in J. Hastings, "Encyclopedia of Religion and Ethics II", p. 889-890 (1908-1927). Kroeber, A.L. "Ethnology of the Gros Ventre", Anthropological Papers of the American Museum of Natural History pp. 145–283. New York: Published by Order of the Trustees (1908). Powell, J.W. (Director). Ninth Annual Report of the Bureau of Ethnology to the Secretary of the Smithsonian Institution 1887-'88. Washington, D.C.: Government Printing Office (1892). Hart, Mickey Planet Drum, A Celebration of Percussion and Rhythm pp. 154–155. New York: HarperCollins (1991). Battaglia, R., Sopravvivenze del rombo nelle Province Venete (con 7 illustrazioni), Studi e Materiali di Storia delle Religioni 1 (1925), pp. 190–217. This page was last edited on 17 February 2019, at 19:08 (UTC).